Coffee contains very large amounts of multiple antioxidants, including hydrocinnamic acids and polyphenols. Hydrocinnamic acids are very effective at neutralizing free radicals and preventing oxidative stress. While drinking coffee brings these benefits, helping one from the inside out, your body can also soak them up in reverse! Check out these many benefits of your morning brew, along with some fantastic recipes. Just remember that when it comes to drinking coffee, it’s best to stick to the recommended limit of 400 milligrams of caffeine each day to avoid dehydration, which can counteract some of its benefits. Coffee grounds have the ideal consistency for creating the ultimate exfoliator, in addition to offering caffeic acid, which is known to increase collagen production. Collagen is a protein produced by our cells that helps “hold” the skin together, keeping it looking younger and giving it firmness and elasticity. When we’re young, our skin stays plump and smooth because it constantly regenerates itself, but as we age, collagen production slows and existing collagen can become damaged due to poor skin habits and sun exposure. The result is skin that looks aged and haggard. Give your skin a boost by using coffee grounds! While some are under the impression that a “scrub” should hurt a bit for it to work, that’s simply not true. That can actually damage the skin. To use the grounds, grind your coffee beans so that it isn’t a sharp exfoliant, but a more gentle one. Some of the seed exfoliants tend to hurt due to their irregular shape. You can simply scrub the grounds all over your body for a natural exfoliant that will help make rough, dry skin silky smooth again. Rubbing them into your skin helps to slough off dead skin cells, leaving it refreshed and re-energized. Another option is to use this great, easy to make DIY coffee scrub recipe. You’ll need one cup of warm coffee grounds, two tablespoons extra-virgin olive oil and a half-teaspoon of sea salt. First, lay down an old towel or some newspapers onto your bathroom floor in order to make cleanup easier. Now, mix all of the ingredients together and apply it onto your skin, particularly focusing on those extra-dry areas. Rub it on thoroughly, paying special attention to areas like the feet and elbows that tend to get really dry. Leave the grounds on for about two minutes and then brush them off, getting as much as you can off of your body before you get into the shower. You can wash it off in the shower, but you’ll want to cover your drain with mesh in order to avoid clogging it. If you have dark circles, or puffy, tired eyes with “bags” underneath, it can make you look years older than you really are. They can result from a number of different factors, from seasonal allergies or poor sleeping habits to hormonal fluctuations, genetics and more. While cosmetic concealers can cover them up, they don’t get to the root of the problem and often come with a host of potentially harmful chemicals as well. In fact, sometimes those various irritants you put onto your skin can contribute to under-eye bags, making the issue worse than it was to begin with. Coffee can make for a quick and easy remedy that actually solves the problem, rather than simply covering it up. While you probably wouldn’t think the same ingredient in your coffee that wakes you up would help erase that puffiness and those dark circles, it really can. That’s because caffeine, when applied to the skin, actually serves as an anti-inflammatory, which is known to reduce swelling. It constricts the blood vessels just below the skin’s surface, which reduces the swelling of puffiness, and it can help balance out skin tone too. To take advantage of coffee’s caffeine to eliminate eye bags and dark circles, all you need is one-half teaspoon of ground up coffee beans, a pinch of ground black pepper, a half-teaspoon of coconut oil and a few drops of water. The water and oil help to release the oils that are contained in the pepper and the coffee, while allowing the mixture to spread easily and evenly across your under-eye area. Simply mix the ingredients into the palm of your hand using your finger, and then apply it in equal proportions to the underneath of each lower eyelid. Be careful not to get any of the mixture into your eye as it will sting. Leave the mixture on for 5 to 10 minutes, or until it starts to dry. Now, dampen a cotton ball or a soft cloth to gently wipe it away. You’ll look well rested, refreshed and feel more ready to start your day than ever before. Coffee is also an excellent ingredient to use as a foot scrub, as it can not only help in the removal of dead, dry skin cells, but it can help soothe tired feet after a long day. Treat yourself by making this fabulous coffee foot soak. All you need to do is brew about two-and-a-half-cups of coffee – you want real coffee, and preferably organic, so that you aren’t getting any toxins in your foot soak. Allow it to cool for about 30 minutes first, or to a temperature that feels soothing to your feet. Now, fill a bath with warm water, enough so that it covers your feet completely, and add a half-cup of coarse sea salt, which offers exfoliating effects (avoid fine sea salt as you won’t get those important benefits). Next, add a couple of teaspoons of coarsely ground coffee and a few drops of pure vanilla extract, which adds to the relaxing effects. Dip your feet in the coffee soak and relax – 30 minutes is ideal. When the water starts to cool, just mix in a little more hot water to keep the temperature to your liking. When you’re done, gently dry your feet with a soft towel and moisturize well. If you’re a brunette, you’re in luck, as you can enhance the color of your hair using coffee grounds. The acidity in coffee not only helps to smooth the cuticle of the hair, but it gives it extra shine. It’s a lot more simple than hair dye too – all you have to do is mix in a teaspoon or two of ground coffee into your normal hair conditioner and allow it to sit for at least five minutes to add depth to the color of your hair. Even if you don’t already have brown hair, you can use coffee to darken up your hair color. This is a great way to go if you want to avoid all of those chemicals in dyes used in home hair coloring kits and salons – for pregnant women, it’s arguably the best solution of all. And, it’s an ideal choice for those who want coloring that’s less permanent, or simply want to see how they look with darker hair without having to commit long term. To do so, you’ll need to put together this DIY coffee rinse. First, wash your hair using your regular shampoo as it’s important that your hair be free of oils and other haircare products. Now brew about two cups of strong, organic coffee, or a little extra – the more coffee you make, the easier it will be to pour over your hair. Allow it to cool down to room temperature or cooler before using for obvious reasons. Burning yourself would neither be fun or good for your hair! Transfer the cooled coffee into a container that will easily allow you to pour it on your hair. Now, get ready to rinse your hair with coffee. You may want to remove your clothing and simply wrap a towel around yourself. Place the container into your sink and then dunk your hair into it. Use a small cup to scoop up the coffee and pour it over the rest of your hair, like the back of your head which is impossible to dip all the way into the coffee. Repeat the process 10 to 15 times, making sure that your hair is totally saturated. Afterward, wring it out, but allow the coffee to remain on your hair for 20 minutes to several hours. You may want to put your hair up in a bun to help prevent it from dripping off. After it sits on your hair for the desired amount of time, rinse the coffee out in the shower. You may need to repeat this method a few times in order to achieve your desired color. Coffee grounds can also help minimize the appearance of cellulite. While some say the effects are only temporary, others disagree, swearing by the results. Even if it does only last for the short term, it may be ideal for those times you want to look great in a bathing suit. Cellulite is something most people struggle with, no matter how much you work out. The caffeine in coffee helps to dilate blood vessels, which temporarily tones and tightens tissue while improving blood circulation and reducing water retention. Those benefits may help smooth that dimpled appearance of cellulite. Coffee’s antioxidants also helps to release toxins, which can also aid in lessening the dimpled look while improving the health of your skin. To use this treatment, combine one-quarter cup ground organic coffee with three tablespoons of hot water. Allow the mixture to sit for ten minutes in order for the coffee to completely absorb the water so that it forms a paste. Next, mix in two tablespoons of extra-virgin olive oil, which helps bind the grounds together, making it easier to spread on while providing additional moisturizing effects. First, cleanse yourself in a warm shower, focusing on areas with cellulite. Then, turn off the water and apply the mixture by massaging it in a circular motion on your skin for several minutes, either using a washcloth or your hands. Rinse with warm water to remove all grounds (be sure to place a mesh on your drain to avoid clogging). Pat dry gently with a soft towel and moisturize well afterward. You can also make a coffee facial scrub that will help brighten your skin to give it a more glowing look while preventing clogged pores. Experts say coffee’s acidity helps to boost the skin’s protective barrier too, which keeps your skin healthier. 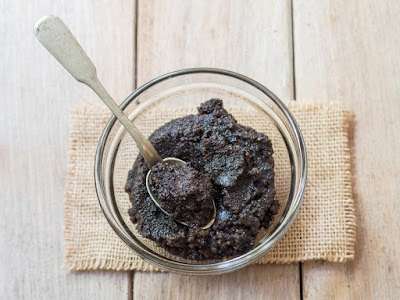 To make this simple facial scrub, just soak some organic coffee grounds in warm, filtered water in a bowl. The grounds will sink to the bottom. Add some Epsom salts and gently stir. Rinse your face using the water from the bowl, and then scoop up the grounds to gently scrub your skin. Rinse using more of the water from the bowl.